Milo Thatch and Princess Kida’s love story is an unlikely match made under the sea. Milo was a goofy academic and Kida was a warrior princess. But that doesn’t matter to the two young and adventurous couple. What makes them such a lovely couple is that their differences make them all the more suitable. They don’t care if they’re not similar so as long as they treat each other right. Milo tries to look macho in his uniform but his skinny frame just makes him look dorkier. He wears a khaki tank top tucked in olive cargo pants, white knee-high socks, and boots. Kida, on the other hand, prefers her native Atlantean garb which consists of a blue bandeau and a patterned wrap-around skirt. Here’s everything you need to look like Milo and Kida. 1 Khaki Tank Top Wear a khaki tank top that’s a size larger to show how scrawny Milo is. 2 Olive Cargo Pants Pair your top with olive cargo pants for a more utilitarian look. 3 White Knee-High Socks Milo prefers his white knee-high socks. 4 Brown Boots Make sure you wear sturdy and comfy brown boots. 5 Vintage Round Glasses Milo needs to wear his vintage round glasses to see what’s in front of him. 6 Old Leather Journal Make sure to bring an old leather journal since Milo’s translating one of his grandfather’s old journals for his travels. 1 Blue Bandeau A blue bandeau keeps Kida’s arms free to move. 2 Blue Wrap-Around Skirt Atlantean women prefer wrap-around skirts. 4 Blue Crystal Necklace Atlantis is powered by a magical Crystal that its people wear around their neck. 5 Gold Armband Kida accessorizes with a simple gold armband. 6 Gold Teardrop Earrings Kida also likes wearing a pair of gold teardrop earrings. 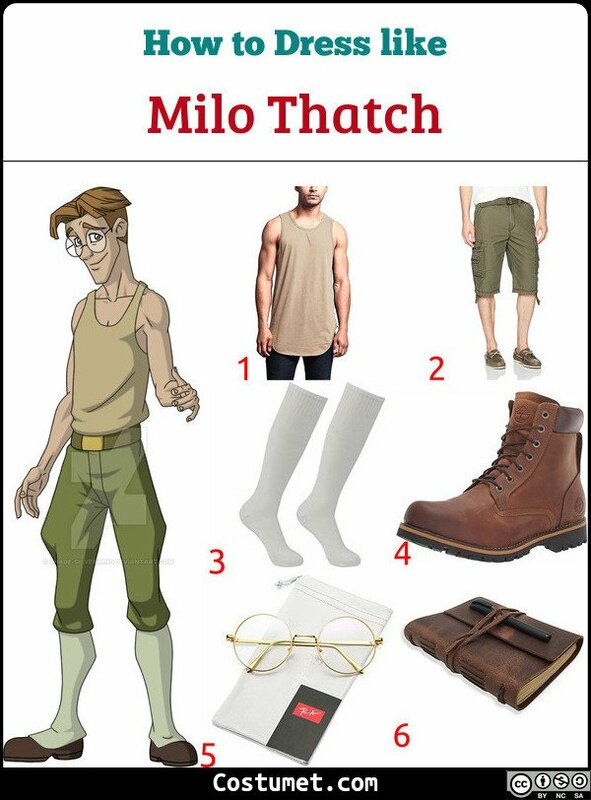 Milo Thatch was voiced by actor Michael J. Fox who is also known for his role Marty McFly in the Back to the Future series. Kida was voiced by Cree Summer who is also known for her role as Cleo in the children’s show Clifford: The Big Red Dog. Vanellope Von Schweetz wears a mint green hoodie, a brown mini skirt, mint-striped leggings, and candy hairclips.